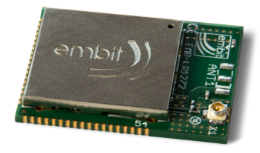 EMB-LR1272 is the first sub-1GHz Embit’s wireless module featuring the Semtech LoRa™ long range modem providing ultra-long range spread spectrum communication and high interference immunity on the 868/915 MHz radio band. It is also compatible with Wireless M-Bus EN 13757-4 specifications (S/T/R/C modes). It is based on Semtech SX1272 transceiver coupled with Atmel® ATSAMD20 MCU, equipped with up to 256 kBytes of FLASH memory and up to 32 kBytes of SRAM memory. EMB-LR1272 can communicate with other devices through a wide range of serial interfaces: UART, I2C and SPI ports, several digital and analog I/O ports useful for the management of external devices and interfaces. EMB-LR1272 firmware can be easily developed thanks to the Embit SDK, which is compliant with the Semtech LoRaMac protocol.